There are some words that are the same in all languages. Starting with variations on “hello,” we have words like “mama” and “papa,” “tea,” “coffee,” “chocolate,” “pizza,” “shampoo,” “bikini,” and others that are almost the same pronunciation wherever you go. 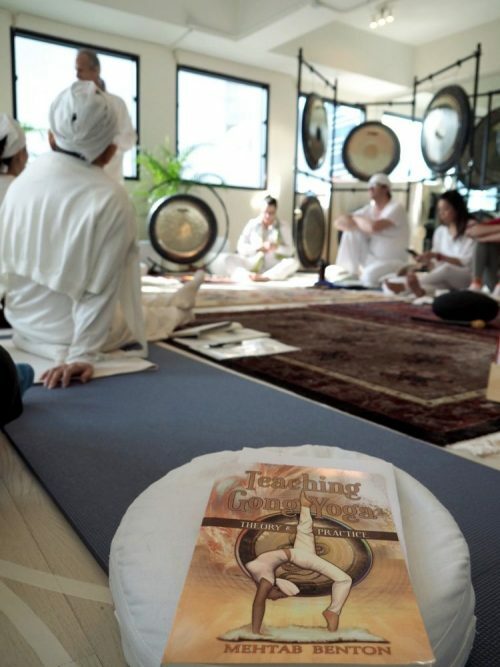 The word gong is a contrived sound that has its origins in the Malaysian “gung” from the 17th century. While there are different ways of saying “gong” in all the world languages, it is also one of those words that is nearly universally recognized. 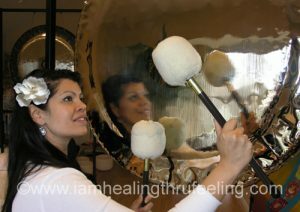 I’ve taught courses internationally on playing the gong in North and South America, Europe, and Asia. Sometimes I have translators, but most of the time I find a common language in the Gong. 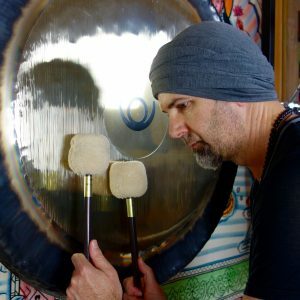 The sound of the gong is universally recognized, and people from all cultures have an immediate response and connection to it. 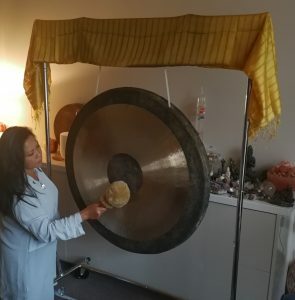 Whether in Sweden or Hong Kong, Brazil or Belgium, it is through the gong that I connect to all the students regardless of the language we speak. 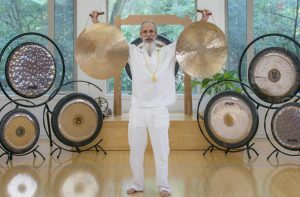 It has been said by my teacher Yogi Bhajan that the Gong is the mother of all sounds, all mantras, and hence all languages. 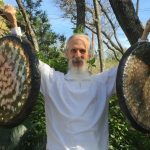 When the gong speaks, we all hear the same sound and we all share in the same experience that unites us all – the sense of elevation and transformation that is the purpose of our commonly shared existence and eternal nature. This month students from Thailand, China, Australia, Philippines, and the Americas are all gathered together in a studio in Hong Kong with 22 gongs. And we all speak the same the language! My Favorite Gong … This Month! Every gong is different, and it isn’t easy to say that you have a favorite gong. But for fun, I’d like to use this column to explore (almost every month), my favorite gong based purely on its size. The gongs most people play are generally 24 to 38 inches in diameter, so I’ll start with size 24” gongs this month and move upward in size as we go along. So keeping in mind that we are only looking at 24” size Paiste gongs, which are my favorites? My first gong was a 24” Paiste Symphonic gong. The reason? It was the only gong I could find in the days before the internet. It was a left over from a high school band order that they never picked up from the music store. I really did not know there were other sizes or brands available, so that was my first gong by default. I loved it (and still do) for several years before I started branching out. It is still a wonderful starter gong that travels well and can be held and played (as can all the other 24” gongs). There will always be a soft spot in my heart for the 24” Paiste Symphonic, but I must admit to having other favorites that size now. 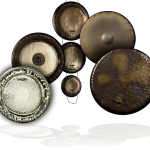 The other contenders in this size category from Paiste are the five planetary gongs: Venus, Neptune, Uranus, Moon (Sidereal), and Moon (Synodic). Yes, there are two different Moon gongs and students (and even long-time players) sometimes get very confused and mislead by the differences. I’ll go into these differences in my next book, but for now just realize they are tuned differently. Of these five, two are tuned to the frequencies of two of the chakras: Venus to the sixth chakra and the Synodic Moon to the second chakra. As a yoga teacher, I’m going to lean toward these two for working with the chakras and say goodbye (with great regrets) to Uranus, Neptune and the Sidereal Moon gong. Venus or Synodic Moon? If I must pick one, I’m going to go with the Moon. 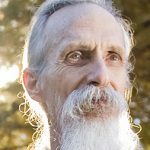 My experience is that all the gongs work with the sixth chakra and opening intuition. The Moon gong has the added ability to heal the emotional body, and balancing the second chakra is foundational in our relationships.